Thanks so much for your interest in joining our Blessed Coast volunteer family. A lot goes into creating this festival and we are so grateful for the hard work of our volunteers! Volunteers will contribute 12-14 hours in exchange for a full weekend pass (including first dibs on camping) for Blessed Coast. All volunteers are asked to pay a $70 impact fee to support our efforts to leave Cheekye Ranch unaffected by this festival. Please read through the descriptions for the volunteer teams needed for Blessed Coast 2018. You will be able to select your preferred team during the application process. 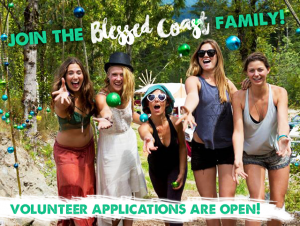 Join a team of volunteers that attend events and attractions in Vancouver and Squamish to share Blessed Coast with our larger family. This job is for you if you are super excited about what we are creating and want to share that excitement with others. This role will not adhere to the 12-14 hour standard since it is Pre-Festival. Our Build Crew will be constructing stages and other structures, decorating and installing finishing touches, and working with the land. Experience in carpentry, decor, and landscaping is helpful in this role. Access to personal tools and vehicles a plus! This role will not adhere to the 12-14 hour standard since it is Pre-Festival. Help us nourish our Blessed guests this year! You’ll be working with our chefs to provide the yum to our artists, staff, volunteers, and hundreds of guests. Blessed Coast is a safe space for people of all ages, and we want to keep it that way. Help us look out for everyone by monitoring patrons, addressing any confrontations, reducing potential harm, and promoting mutual consent. Experience preferred. Include any security certifications or experience in your application. Help our first aid experts keep our guests healthy and happy! Experience required. Include any first responder or higher first aid certification in your application. Welcome the world to Blessed Coast! This is a very important job because we want to ensure that guest intake is being handled professionally and with love. Volunteers will need to work well under pressure and be highly organized. This position requires a high level of responsibility. Experience is a plus, so let us know if you have done gate/box office work before. Part of welcoming guests to Blessed Coast is getting them parked and situated on the land, this team will help us fit as many cars as possible into the designated parking areas. Our parking volunteers will also help guests get acquainted to the festival site. Our production quality gets more advanced every year, and our tech volunteers help make our stages an immersive experience for everyone, including our artists. Experience required. Include any sound, lighting, and tech experience in your application. Do you have a basic understanding of sound and lighting equipment? Help us make transitions between acts quickly and gracefully. Volunteers must be able to lift heavy objects and follow directions carefully. Experience preferred. Are you comfortable interacting with international artists, providing for their needs, and keeping a level of professionalism within yourself and the space around you? Our hospitality volunteers keep our artists happy by making sure their space is clean, clear, and always topped up with drinks and snacks. Everyone at Blessed Coast respects the land and makes a conscious effort to be eco-friendly. Our green team takes extra care to ensure that we are a zero impact event with a commitment to leaving no trace. Volunteers will pick up trash, sort garbage, compost and recycling, and help guests get acquainted with our waste systems. Love working with kids? Help out at the Kids Zone this year and experience the joy of a community that is fun and safe for kids and adults! Experience preferred. Include any experience working with youth in your application. Help spread the good vibes by sharing our artists’ merchandise with their fans and providing guests with all the answers when it comes to the festival site and amenities. Volunteers should be familiar with the festival and enjoy interacting with people (with a smile on their face). Floaters help with a range of tasks on the land including re-stocking bathrooms, running equipment and tools between areas, and relaying information. Floaters will be used wherever they are needed throughout the event. If you love the land at Cheekye Ranch and want to see it returned to its natural state of stillness after our festival, please join our clean up team and help us leave without a trace! This team will assist with tear down and ensuring that items are carefully handled for proper storage. This role will not adhere to the 12-14 hour standard since it is Post-Festival.